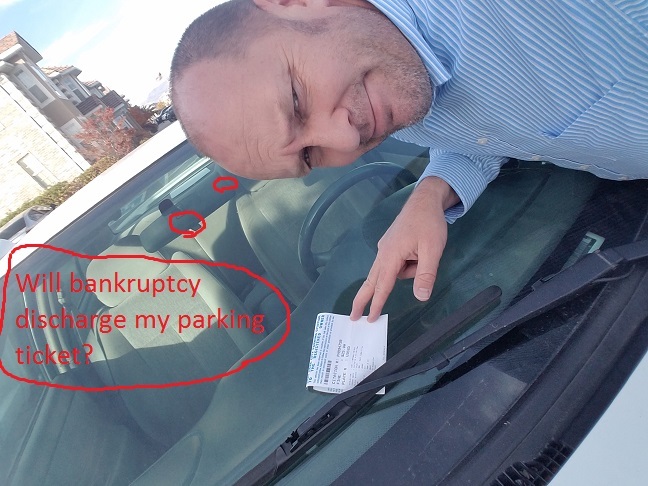 Will bankruptcy discharge my parking tickets? A chapter 7 will not discharge your parking tickets. A chapter 13 will discharge your parking tickets, but only if you pay them off in full over your 3-5 year plan. A ticket is a fine or penalty payable to and for the benefit of a governmental unit. 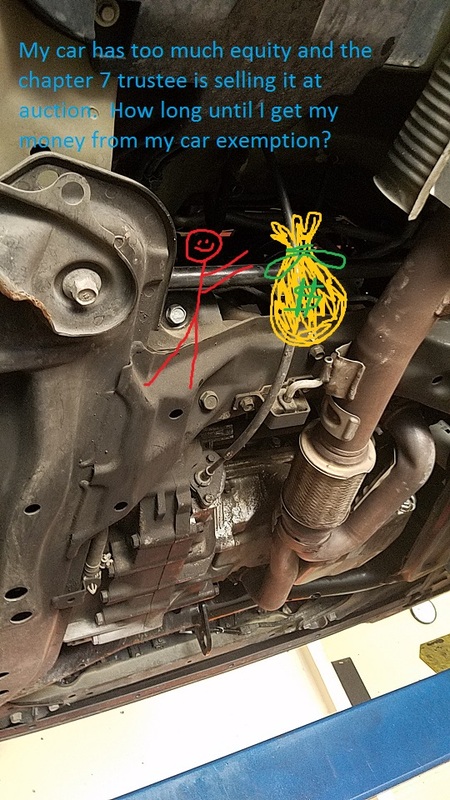 The ticket pictured above is a fine/penalty which I now get to pay to the City of Salt Lake. 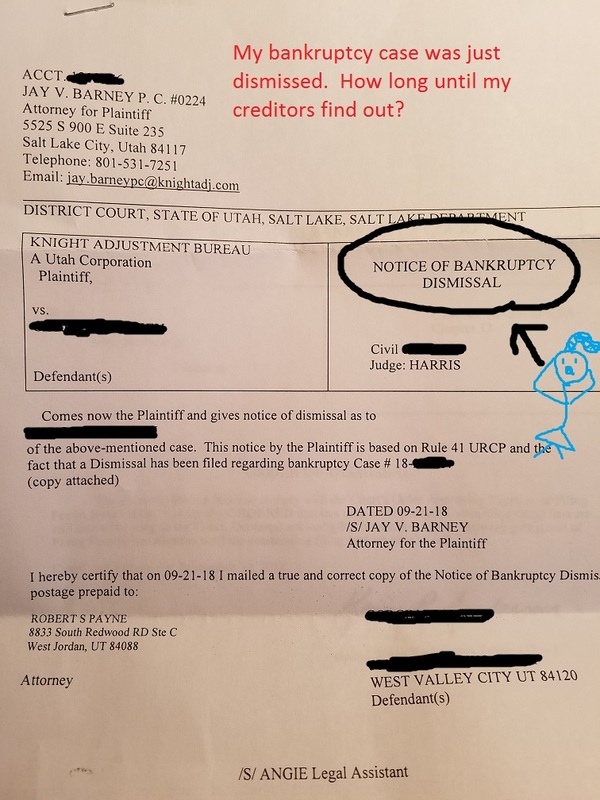 This entry was posted in Utah Bankruptcy on October 29, 2018 by robertspaynelaw. 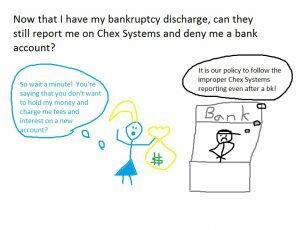 Now that I have my bankruptcy discharge, can they still report me on ChexSystems and deny me a bank account? No, but it’s a mess to clear it up. Bankruptcy may discharge your debts, but it doesn’t necessarily clean up your credit. That’s something you’ll have to watch like a hawk to clean up and improve. Chex Systems, Inc. (ChexSystems) is a nationwide specialty consumer reporting agency under the federal Fair Credit Reporting Act (FCRA). 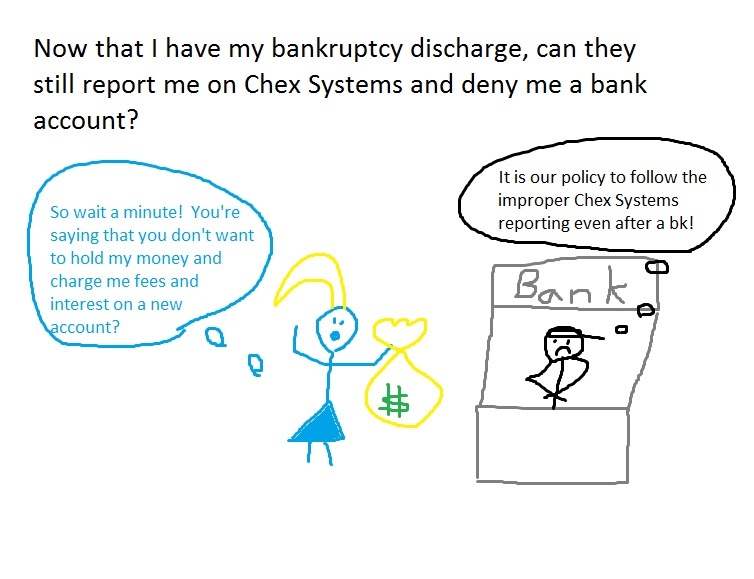 ChexSystems’ clients regularly contribute information on closed checking and savings accounts. See Chex Systems front page here. Give them 30 days to clean it up and take off the negative reporting. 99% of the time, this should take care of the problem. If it doesn’t, then you get to jump through hoops to clean up your credit report and/or Chex Systems. This entry was posted in Utah Bankruptcy on October 24, 2018 by robertspaynelaw. 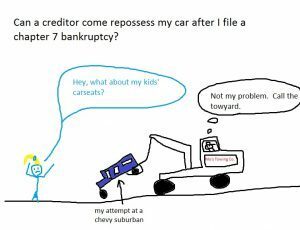 Can a creditor come repossess my car after I file a chapter 7 bankruptcy? No, but sometimes they do. When you file a chapter 7 bankruptcy, you file a statement of intention with the court letting your creditors know if you’ll be keeping your secured loans (like car loans and mortgages). You keep making payments on these loans, eventually sign a reaffirmation agreement, and the loans survive bankruptcy. However, sometimes people are behind on car payments and file a bankruptcy with the intention of surrendering the car in bankruptcy and wiping out the debt. Usually, the car lender will give you 1-3 months before they repossess. They are hoping that you’ll change your mind, reaffirm the debt, and keep making payments. Sometimes, clients even file the case right before a repossession, hoping to stall the repossession for a few more months so that they can drive the car rent free while they look for something else. Just this morning, a client contacted me asking if she should worry about a repossession in the middle of the night. 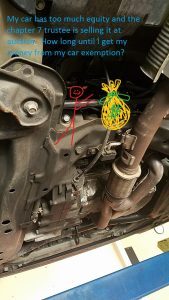 She is about 4 months behind on her truck, we filed a chapter 7, and she will be surrendering it back to the lender when they contact me to make pick-up arrangements. Client — Will they just randomly pick it up though? We have carseats etc I’m worried about lol. Or do they have to give us some sort of notice? Me — Technically, they should file a motion for relief from stay to repossess the vehicle, but they usually won’t in a chapter 7. 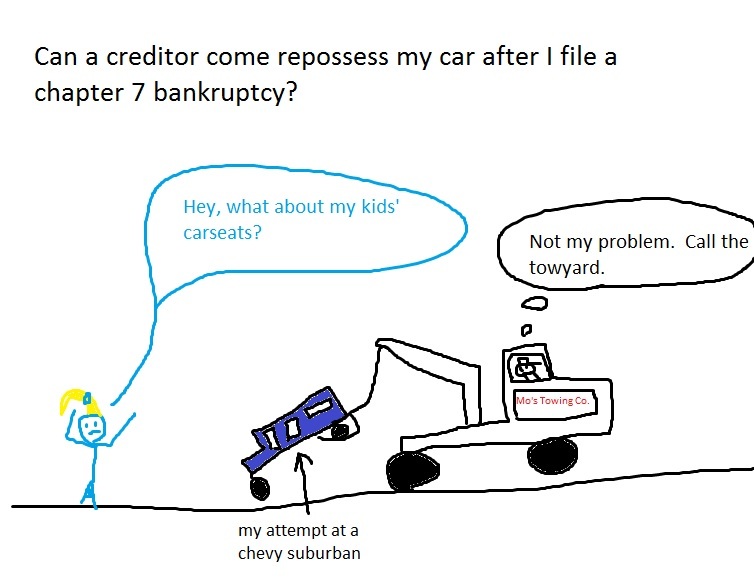 At the meeting of creditors, the trustee directs debtors to surrender their vehicles that they aren’t reaffirming. Relying on this, creditors will come repo even without a motion for relief. Even worse, some really nasty lenders will come repo the day after we file bk knowing that even if I file a motion for sanctions, I would have to show that not only had we become current, but that we were making ongoing payments. That being said, usually everyone plays nice and contact me before the repossess a vehicle. So yes, they should file the motion, but they usually don’t (in a chapter 7). About 90% of the the time the creditor will contact me, ask for permission to contact you, and then they’ll call to make pick-up arrangements. Some creditors even ask us to simply drop off the vehicle with the keys at the nearest bank/credit union. The other 10% of the time, they come in the middle of the night. It is disconcerting, but we can still wipe out the debt, so there are no repossession fees. This entry was posted in Utah Bankruptcy on October 16, 2018 by robertspaynelaw. 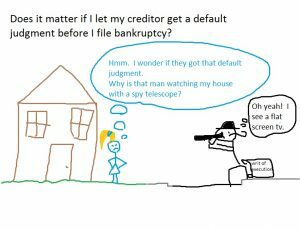 Does it matter if I let my creditor get a default judgment before I file bankruptcy? You’ll hate this answer: it depends. If you let a creditor get a default judgment against you, it is not the end of the world. Bankruptcy will generally wipe out your liability on that default judgment. You can usually file your bankruptcy quickly enough to stop any kind of collection even if the creditor gets a judgment. 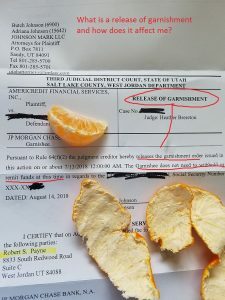 garnishment (takes about 2 weeks after the judgment) … If the creditor knows where you’re working, he will file garnishment paperwork and start hitting your paychecks for about 25% a paycheck. 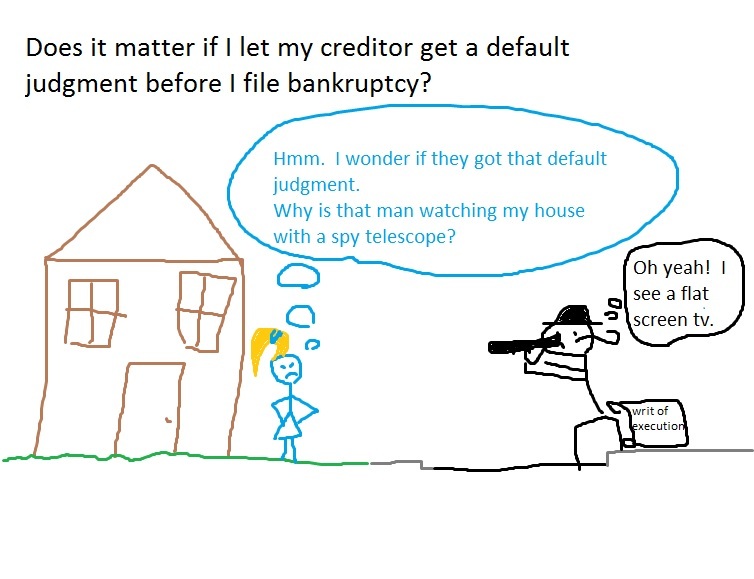 negative credit (immediate) … Even when the bankruptcy discharges your liability for the judgment, that judgment still sits on your credit report as a public record for the next 7 years. attachment (immediate to a few days depending on where you live)…If you own a home, the creditor can run down to the county recorder and record that judgment against your home. Now when you file bankruptcy, you’ll have to pay extra legal fees to strip or avoid that judgment lien (if you can). writ of execution (takes around 2 weeks) … The creditor may come to your home with a sheriff and a writ of execution, which allows him to take your property (like laptops, kid’s gaming systems, and your television) and sell it at auction to pay off the debt. bank levy (can happen in less than a week)… The creditor levies (takes) the balance in your bank account on the day the levy hits. And yes, bankruptcy can stop these. However, it sure is nice to file bk before the storm hits. This entry was posted in Utah Bankruptcy on October 8, 2018 by robertspaynelaw. This entry was posted in Utah Bankruptcy on July 18, 2014 . I’d like to update this. You do have another option called redemption (after filing your bankruptcy). With redemption, you can secure an outside financing company to finance the car loan for after you file bankruptcy. However, I have never tried it with a cross-collateralized loan. In theory, it should work, and you can keep the vehicle. 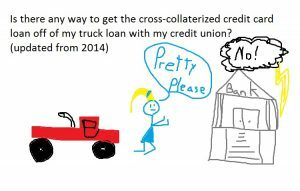 The reason I am posting this today is because I have a client who wants to keep his truck loan, has equity in his truck, and even has a family member who will purchase the vehicle from the credit union and then sell it back to him over time (as his new, title-holding secured creditor). 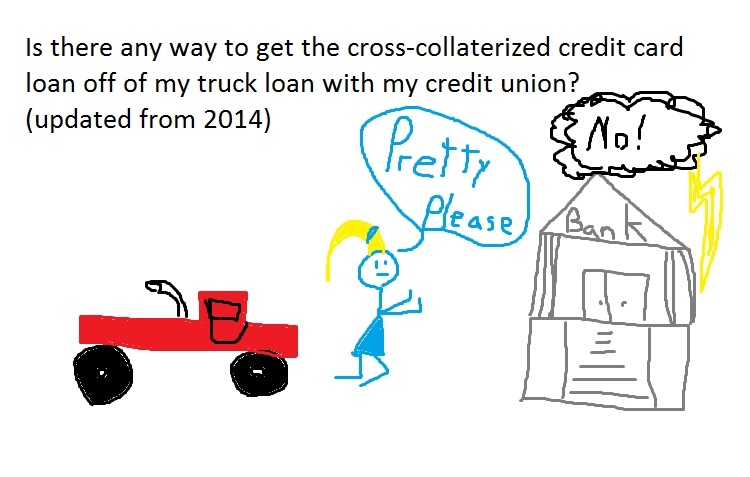 However, the credit union is refusing to sell the vehicle without us paying off the cross-collateralized loan in its entirety as well. We have offered to pay off the secured loan in full, and they refused. They would rather receive nothing, go through the repossession process, and take their lumps by selling it at auction (our chapter 7 bankruptcy will wipe out any remaining deficiency balance). It doesn’t make sense. That being said, I am giving my client the same advice that I give to almost every client with a financed vehicle: give it up. I don’t like car payments and I don’t like the added expense of higher comprehensive insurance which is required for that financed car. 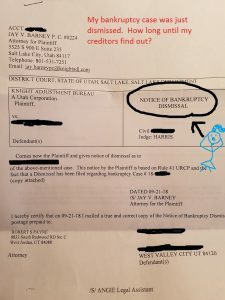 This entry was posted in Utah Bankruptcy on October 1, 2018 by robertspaynelaw. 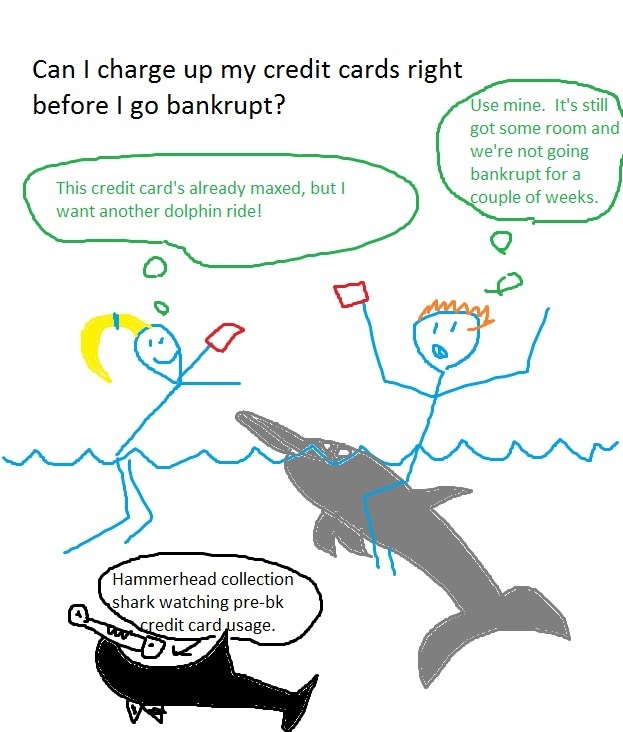 Can I charge up my credit cards right before I go bankrupt? Yes, but it’s a really bad idea. Short Answer: Your case could be dismissed for bad faith. Or, that creditor may sue you for nondischargeability (meaning that you still have to pay that debt back plus attorney’s fees and interest). Remember to avoid cash advances within 70 days of bk and charges of more than $500 in the 90 days before bk for luxury items. Long Answer: It can hurt you. I filed bankruptcy for a client last year who charged up over $10,000 in credit card charges on one card in the 2 months before we filed bankruptcy. I didn’t know about it and had even asked him about recent purchases. I am betting that he hoped that no one would notice. It should have been a fairly simple case, but then I received the creditor’s lawsuit, called an adversary proceeding. 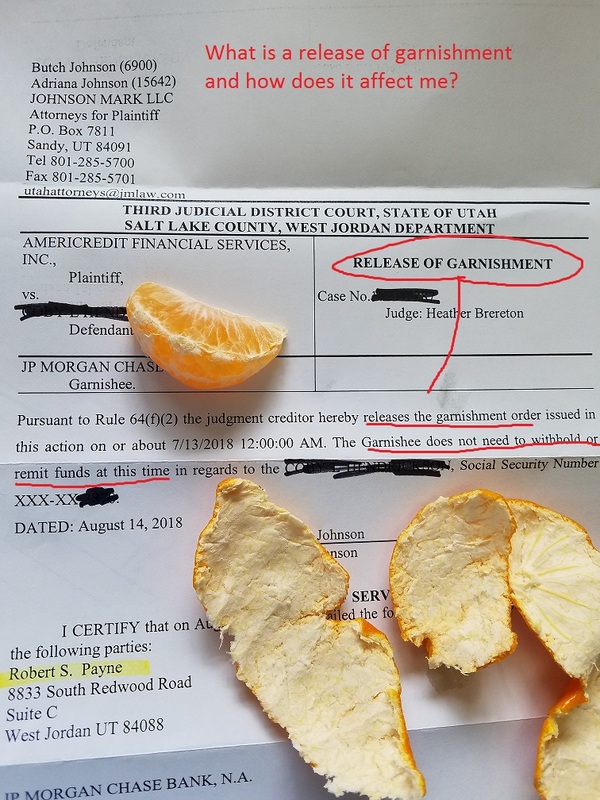 Officially, it was titled a “Complaint Seeking Exception to Discharge Pursuant to 11 USC s 532(a)(2)A) and/or 523(a)(2)(C) and/or 523 (a)(1) and/or 523 (a)(14A).” A big, scary bankruptcy court lawsuit. I have put in the code sections below. Basically, my client had used his credit card to pay off about $1,500 in property taxes and spent the rest on lots of toys for his family. I fought the lawsuit, and we settled for about $6,000, which is much, much better than it could have been. Take out cash advances of more than $750 within 70 days of filing bk. Any of these items can lead a creditor to sue you in bankruptcy court. You will most likely lose that suit and have to pay the monies back. This entry was posted in Utah Bankruptcy on June 22, 2018 by robertspaynelaw.